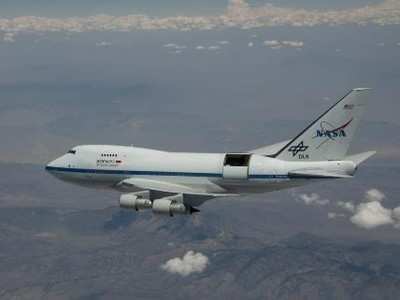 The partial government shutdown has forced NASA to stop flying its SOFIA airplane, a modified Boeing 747 which carries a 2.5 meter (8.2-foot) telescope mounted in its fuselage. The Stratospheric Observatory for Infrared Astronomy (SOFIA) has been grounded since December 22 when the shutdown began, according to Harold Yorke, director of SOFIA science mission operations at the Universities Space Research Association. Speaking at a town hall session held at the 233rd Meeting of the American Astronomical Society (AAS) in Seattle January 8, Yorke apologized to the principal investigators who had been scheduled to fly during the shutdown. Space News reports that the grounding stands in contrast with NASA's spacecraft missions, which continues operation of "tracking, operation and support" of satellites "for safety and protection of life and property," according to the agency's shutdown plan.